Actress Shraddha Kapoor celebrated Ganesha Utsava with her grandparents as per a 56-year-old tradition on Thursday. 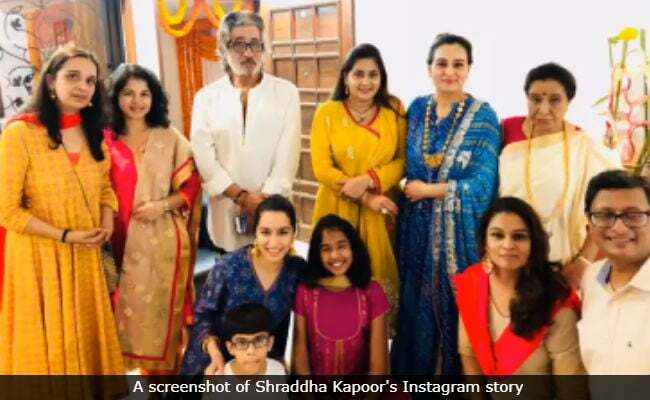 Shraddha, who was recently seen in Stree, shared a picture of her mini-pandal at her grandparents' home and wrote: "Aala re aala, Ganpati aala. Ganpati Bappa moriya. #56thYearOfGanpatiBappaAtMyGrandparents." Shraddha was dressed in a simple printed suit with gold jumkis and kadas finishing out her look. 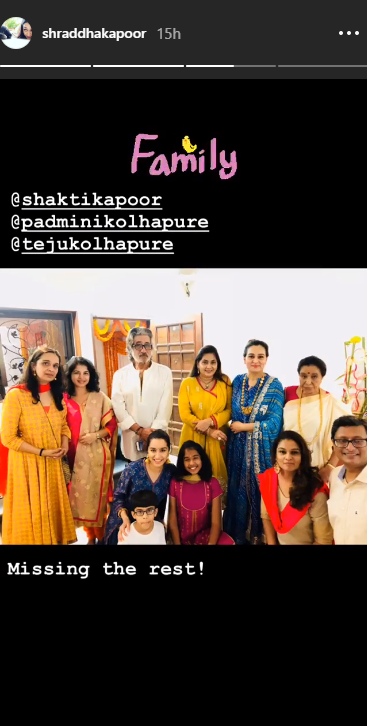 On Instagram story, Shraddha shared some more photos from the festivities, including a family picture in which we could spot Asha Bhosle, Shivangi, Kolhapure and her sisters Padmini and Tejaswini and actor Shakti Kapoor among others. 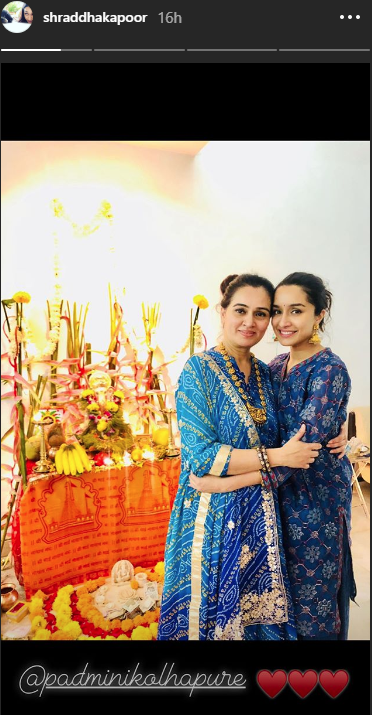 Shraddha also posted a picture of herself with her aunt Tejaswini, who wore a blue bandhej outfit. Shraddha Kapoor is awaiting the release of Batti Gul Meter Chalu. Celebrities gave a grand welcome to Bappa on Ganesh Chaturthi on Thursday. Several celebrities such as Shilpa Shetty, Sanjay Dutt, Hrithik Roshan among others welcomed Bappa with grandeur but only in the presence of their respective families. Nita and Mukesh Ambani invited the creme de la creme of Bollywood to be part of their revelry. Shah Rukh Khan, Salman Khan, Aamir Khan, Amitabh Bachchan with his daughter Shweta, Katrina Kaif, Kareena and Karisma Kapoor, Rekha, Madhuri Dixit and other celebs assembled at Antilla to pay their obeisance to Lord Ganesha. Earlier in the day, Arpita Khan Sharma hosted a grand Ganesha Utsava, which was attended by her family members and friends such as Katrina Kaif and Huma Qureshi among others.